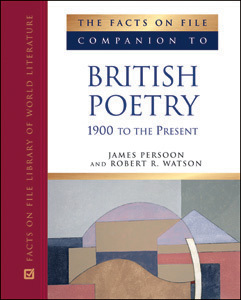 In 450 entries ranging in length from 300 to more than 2,500 words each, The Facts On File Companion to British Poetry: 1900 to the Present is an A-to-Z encyclopedic guide that introduces high school and college students to some of the best-loved 20th- and 21st-century British poets and poetry. Appendixes include a general bibliography and a glossary of poetic terms. Major poems, such as "Anthem for Doomed Youth," "Sailing to Byzantium," "September 1, 1939," and "Do Not Go Gentle into That Good Night"
James Persoon is a professor of English at Grand Valley State University in Allendale, Michigan. He earned a Ph.D. from the University of Kansas and is the author of many scholarly articles and several books, including Modern British Poetry, 1900–1939. Robert R. Watson is associate professor emeritus of English at Grand Valley State University. He earned his Ph.D. from the University of Wisconsin at Madison. "Those libraries that have purchased the first titles in this series will certainly want to add this one as well, as will any library seeking treatment of the lesser-known poets included here. Recommended for high-school, public, and academic libraries." "The robust format of the book, easy navigability and accessibility make it an excellent inclusion for high school libraries seeking to improve their poetry holdings...it would also positively contribute to the holdings of public libraries..."
"...a compelling review of the diverse development of 20th-century British verse...Recommended." "...extremely well written, clear, and scholarly...a deliciously inspiring collection of essays."